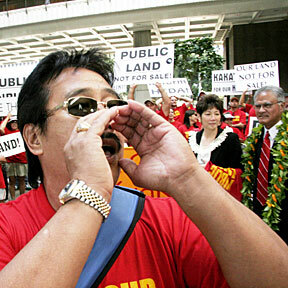 STATE OF THE STATE: A march by the Friends of Kewalo Basin Park Association at the state Capitol yesterday protested development of the Kakaako area. Among those listening were Sen. Carol Fukunaga and Senate President Robert Bunda, right. Low-income families would pocket $1,568 under the proposal. The governor also adopts Bunda's plan for fairer tax brackets. The lender settles a lawsuit alleging predatory practices. Interim President Gideon Toeplitz sees improvements in his brief tenure. The forward scores 15 in the second half as the Rainbow Warriors pull away for a win. Shareholders have sued over the sale of the land company to Steve Case. Gov. Lingle has proposed directing nearly half of the state's budget surplus to tax relief measures.